For 30 years Amy Meshkati has been developing hair-restoration techniques that invariably send her clients away rejoicing, more luxuriantly coiffed than ever before. With the opening of her new clinic in Belgravia – the first in the UK – she brings her expertise and unique, undetectable solutions to the heart of London. 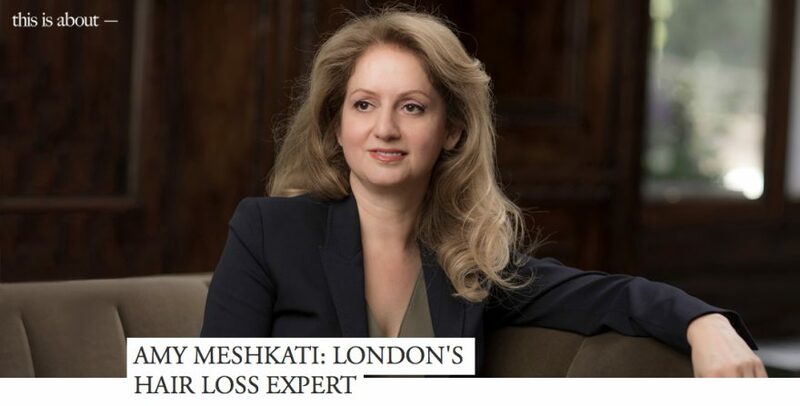 Amy Meshkati’s treatments are innovative but not intrusive, based on years of research into forensically detailed hair-matching, and requiring complex three-day procedures. Her list of clients, whose identities she keeps a closely guarded secret, ranges from Middle Eastern potentates and Saudi wives to Hollywood stars and English musicians. One of her most famous clients told the world that, following his treatment at the hands of ‘Amy in Paris’, he was so impressed, ‘I threw my hat collection away’. After that, says Amy, ‘the phone never stopped ringing’. From that starting point she became involved in hair-loss treatment when it was a very imperfect science. ‘Prevention treatment was very limited,’ she says, ‘and corrective action mainly meant a hair transplant – the results were not natural or appealing at all!’ She began researching hair-loss therapy and offering solutions. ‘I was very young,’ she says, ’but passionate about my work. Some very important people trusted me, and word quickly spread.’ She also invented a range of hair products that helped to prevent hair loss.